Finding the right finish for thousands of public swimming pools shouldn't be that difficult...should it? Sounds pretty futuristic but, in fact, this technology has been available and out performing every other pool finish for years. The technology started in Europe over 30 years ago as an alternative to time honored failing marcite and plaster pool finishes. Its easy right...Just provide a water tight finish that will last... not chip, flake,peel or fail due to frost or structural movement...? So what's so hard about getting it ? All the pool finishes offered to you in the past have been water tight and beautiful ...for a little while. Then...plaster etches,pops, stains and removes skin like sand paper,..paint peels,..tile cracks and fiberglass comes off in sheets.. They all rely on a chemical bond to the substrate. They try their best to form a mechanical bond, on a molecular level, but as soon as you throw a little ground water, ice or structural movement into the equation. ...POW!!... Now you're looking for a way to repair the repair...maybe another coat will work....It's covered under warranty....Maybe another type of coating will work...STOP!! 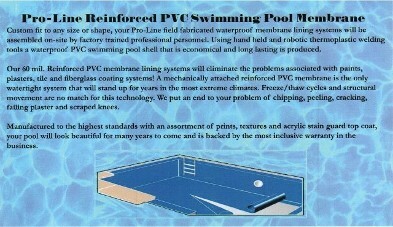 If you want your swimming pool finish to last 20-30 years (the life of this product has yet to be determined). You need to weld it, anchor it, use stainless steel and materials that are inert and not effected by climate to produce a finish that is virtually indestructible, beautiful and enduring. If you want a permanent solution to old problems a mechanically fastened reinforced PVC shell is the answer! !